John Terrell '08 (above) was awarded the College of Business Alumni Award for Outstanding Career Achievement at an October 16 ceremony. 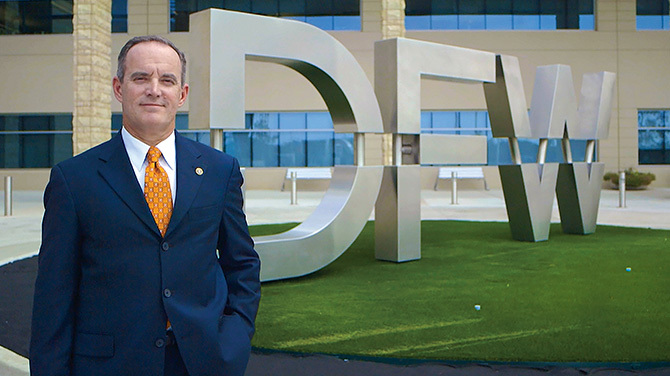 He is vice president of commercial development at the Dallas/Fort Worth International Airport and served as mayor of Southlake from 2009 to 2015. Kathy Weaver '14, who serves as senior vice president, chief human resources officer at Ryan, a global tax services firm, was recognized for Outstanding Early Career Achievement. Eric V. Brown, president of the College of Business Advisory Council from 2013-15, received the Dean's Award for Extraordinary Service. David LaFevor has spent the last 15 years documenting and preserving Cuba’s rich history and vibrant culture.